United Airlines recently made headlines for violently removing a paying customer from an overbooked flight. How does an organization end up in a position where it’s physically abusing its customers? Looking closely, we see that the state of United’s customer experience practices makes this and other disasters practically inevitable. The first rule of flight club is don’t talk about flight club. On April 9, 2017, a United flight from Chicago to Louisville was fully booked. The airline realized that it had four crew members that needed to be in Louisville to staff a flight the next day, so they chose to bump four customers, all of whom were already seated. The airline staff offered $400 and a hotel room, then $800, but nobody volunteered to give up their seat. At this point, the staff fell back on a computer algorithm to choose four passengers that would have to involuntarily give up their seats. The first three complied, albeit grudgingly, but the fourth one was a Kentucky physician named Dr. David Dao. He refused to give up his seat, arguing that he had to return home to see patients in the morning. Based on various cell phone recordings made by other passengers on the flight, the staff argued with Dr. Dao, who loudly but peacefully insisted that he would not give up his seat. Eventually the staff called the aviation police to remove Dr. Dao. And then it got ugly. After a brief exchange, the officers physically pulled Dr. Dao from his seat, apparently smashing his face into the armrest. As he shrieked, they dragged him by the arms down the aisle of the aircraft. Other passengers recorded the incident on their phones, showing Dr. Dao with blood running down his face and his glasses askew. News media later reported that he had a broken nose, lost two front teeth, and suffered a concussion during the incident. Even more bizarrely, Dr. Dao somehow managed to run back on to the plane later, hysterically repeating “I have to go home. I have to go home.” Law enforcement again removed him, and then the airline had everyone leave the plane while they cleaned up the mess. More than two hours later, the flight finally took off. Thanks to the power of cell phone video and the Internet, the whole world knew about the incident almost immediately. The image of a paying customer being dragged from his seat touched a nerve, and the world was quick to pile on United. Some apologists missed the point and stated that Dr. Dao should have given up his seat. Others dug around in his past and found that he might have a criminal record, resorting to character assassination as some odd way to justify United’s actions. Always ready to unleash some snark, the Internet created a bumper crop of memes. 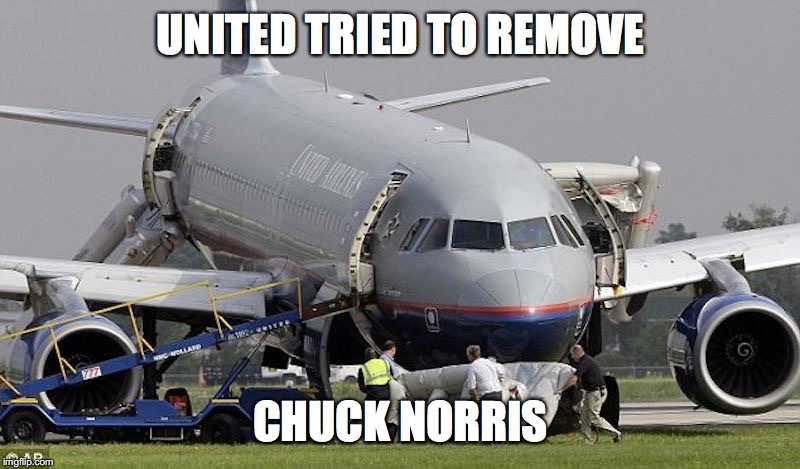 United doesn’t remove Chuck Norris. Chuck Norris removes United. The CEO’s non-apology was even more tone-deaf in its Orwellian choice of language. Re-accommodated? Hoo boy, the Internet had a field-day with that bizarre choice of words. You are free to use any methods necessary, but I want them alive. No disintegrations! As the story exploded and the reaction became even more furious, Munoz got the hint and issued a more complete apology that actually expressed regret and took responsibility for the situation. A skeptical public was not impressed. I’ve said before that CX failures tend to happen in bunches, and United demonstrated that big-time over the last several weeks. Looking back even further, however, United clearly has a huge problem with treating customers well. Way back in 2008, United made the headlines when baggage handlers broke a $3,500 Taylor guitar belonging to Canadian musician Dave Carroll. After multiple fruitless attempts to get reasonable compensation for the ruined guitar, Dave and his band Sons of Maxwell recorded and released a trilogy of songs called United Breaks Guitars. The first song went to number one on the iTunes download list, prompting United to contact the musician and offer to make things right; it does not appear that they were successful. At the time, United claimed that it hoped to learn from the incident and improve its customer service. On March 26, 2017, two groups were traveling separately on a United flight. The first group of three were traveling on a travel pass through United’s company travel perk program; that group included two teenage girls wearing leggings who attempted to board the flight. A female gate agent notified the two girls that their leggings violated the travel pass dress code. The teenagers left the gate area without incident. A second group in line behind the teenagers, including a younger girl also wearing leggings, is believed to have seen the exchange between the gate agent and the teenagers who were denied boarding. A woman in the party took a dress out of the party’s carry-on luggage to cover the younger girl. “I guess @united not letting women wear athletic wear?” Watts tweeted to her more than 32,000 followers. The policy against spandex comes from a specific dress code for employees and guests of employees, and dates to an era when people routinely dressed more formally to fly. While it might be reasonable to monitor the dress of clearly visible United employees, this seems like another pointless self-inflicted black eye. United also has the dubious distinction of having more pet fatalities than any other airline in both 2015 and 2016. In those two years, 23 pets suffered injuries and 23 died, out of a total of 206,305 pets transported. That translates into a 0.02% chance that Fluffy was hurt or killed – decent odds, but cold comfort if it’s your dog that arrives dead. In 2012, fashion model Maggie Rizer flew two of her golden retrievers on a United flight from New York to San Francisco. When she and her family went to pick up the dogs, according to her account, an airline worker casually greeted them with the news that “one of them is dead.” A necropsy found that the dog died of heatstroke. United issued a statement at the time stating that the dog had been in a temperature controlled environment the entire trip. While the deaths themselves are terrible, the casual statement by an airline worker that “one of them is dead” is absolutely astonishing. Then, just a few days after the David Dao incident, one of the world’s largest rabbits, Simon, died on a United flight from the United Kingdom. While it’s not impossible that a giant rabbit might have underlying health issues, a vet had examined him just before the flight. When the owner requested the body so she could have it examined, United revealed that it had cremated the bunny without permission, making any further investigation impossible. And, in yet another attempt to insert his foot further into his mouth, CEO Oscar Munoz said, “We are deeply sorry for the loss of anything from your luggage to, of course, a loved pet.” Because equating the death of a living thing to lost luggage is always the best way to show sympathy. The same week that David Dao was dragged off of a plane, Geoff Fearns was trying to get home from Hawaii. He had bought a first-class, full-fare ticket and was already seated when a United representative ran onto the plane and told him that he had to get off. If he did not, he was told, he would be placed in handcuffs and forcibly removed. Again, the plane was overbooked (apparently due to a mechanical issue that required the airline to swap in a smaller plane) and a higher-priority passenger had to be accommodated. Because United excels at making a bad situation worse, they re-seated Mr. Fearns in coach. In a middle seat. Between a couple who were in the middle of a nasty, bitter argument and refused to sit next to each other. For six hours. They didn’t even offer to refund the difference between his first-class fare and coach. When you have this many customer experience issues over time and across the company, it indicates an underlying series of issues. The current United Airlines resulted from the merger of United and Continental in 2010-2011. Both predecessor companies were long-running airlines, described as “rule-bound”, unwieldy, and with generally poor morale. The merger itself was painful. Jeff Smisek, who was the CEO of Continental and became the CEO of the merged company, stepped down amidst a federal investigation. When Munoz took the CEO role in 2015, he began with an apology for the integration headaches that passengers had endured. Since the merger, United has seen its customer satisfaction decrease. Starting in 2012, the airline was responsible for one-in-three consumer complaints. The following year the company was named the worst airline when it came to customer service scores. Because mergers by definition reduce competition in an industry, they’re rarely good for customer experience. Okay, clueless might be excessively harsh, but Oscar Munoz’s approach to communicating with the public sure could use some help. He correctly identified employee morale as a huge issue when he took over as CEO, and a company’s customer experience will never exceed its employees’ experience. However, he keeps sticking his foot in his mouth when things go sideways, and the message he puts out frequently reassures his employees that they’re doing the right things even when they aren’t. Prior to becoming CEO of United, Munoz had leadership jobs at Pepsico, Coca-Cola, AT&T and the railroad company CSX. Munoz had never run a customer-facing company such as an airline, whose employees deal directly with paying customers. Munoz’s initial failure to consider the passengers’ point of view bodes ill for United’s customer relations in the future unless his approach changes dramatically. His knee-jerk support of United’s staff threatened to encourage intransigence among employees at the gate and on board in dealing with problems. This has been a long-standing issue with United. According to federal statistics, for example, the airline is in the middle of the pack among U.S. airlines for involuntary bumping — at about .45 per 10,000 passengers in 2016. But its number of consumer complaints for bumping and other issues has been consistently among the highest of U.S. carriers: In January, United passengers lodged 174 complaints with federal authorities, compared with only 87 against Southwest, even though Southwest on average carries nearly twice as many passengers. Taking good care of your employees is a great way to take good care of your customers, but you can’t consistently use that as an excuse for poor customer treatment. It appears the airline’s staff reached a point where they simply didn’t know what to do, and nobody was brave enough, or resourceful enough, to come up with something. Summoning the police became the easiest and fastest way out. I hate saying it, but airline culture and training is often such that thinking creatively, and the devising of proverbial outside-the-box solutions, is almost actively discouraged. Everything is scripted, regimented, rote and procedural, and employees are often so afraid of being reprimanded for going against the letter of the law, or for making a bad decision — not to mention chronically being pressed for time — that they won’t make a decision at all, or will gladly hand the matter along to somebody else who can then take responsibility. Workers are deterred from thinking creatively exactly when they need to. No set of rules, no matter how comprehensive, will cover every possible situation. Any set of rules that results in a paying customer being physically abused and denied the service that he paid for clearly needs to be thrown out and rebuilt. A good culture enables and encourages employees to come up with better solutions when the rules fail. The airline industry as a whole suffers from a poor CX reputation. Competition drives customer experience. The government regulates the airline industry heavily, it is expensive to start and operate an airline, and minimal competition exists in many cities. When there isn’t much competition, customer experience inevitably suffers. Despite this, United manages to be worse then almost all of their peers. Among traditional airlines, United ranked 5th out of 6 (only Air Canada was worse, which makes me wonder who the heck they beat up) in the J.D. Power 2017 North America Airline Satisfaction Study. If you include the discount airlines on the same scale, United ranks 9th out of 11, with Frontier Airlines joining Air Canada in the basement. Analyst Hunter Keay, with Wolfe Research LLC, said in a client note that “this fiasco where a man was dragged off a United plane” was “truly a bad situation that shouldn’t have happened and United handled badly afterward.” Nevertheless, “we expect it will blow over. These things usually do. But we do believe policy changes are likely. United is certainly part of an oligopoly, partially shielded from free-market forces by both regulation and the capital-intensiveness of the airline industry. Nevertheless, customer experience drives long-term results. United went bankrupt in 2002, and even being one of a handful of large airlines doesn’t guarantee it a market. CX eventually wins out. It’s true that for an expensive purchase like a flight we tend to be very cost-driven. So we groan a little, click on the button, and buy our ticket. After all, United doesn’t smash every customer’s face in, so we’re probably safe. Someone in authority—pilots, stewards, ground crew—might have realized that this was an assault on a person’s dignity. But no one stopped it. Why not? Not because they are bad people: They too probably looked on in horror. But because they have been conditioned to follow the rules. Those rules said: First, we may sometimes overbook because we want to maximize our profits. Second, we can eject someone because we have overbooked, or if we decide that we want those seats back, no matter what a person can reasonably expect, and no matter how much of an inconvenience this is. And third, and most tragically, human dignity will not get in the way of the rules. A toxic cocktail of capitalism and corporate culture led to a man being dragged along the floor. Viewed through that lens, purchasing a ticket on United isn’t just a business choice, it’s an ethical and moral choice. Would you prefer to do business with an organization that operates like United, or with one that doesn’t? How much is that ethical divide worth? I’ve flown cross-country several times this year. United usually has the faster direct flight, whereas my preferred airline Southwest always has a layover in the middle of the country. Despite the hours of time I’ll spend, despite the fact that Southwest’s one-size-fits-all seating hurts my long leg bones, I always make the same choice. Exercise the choice that you have. It’s your only tool to drive a better customer experience for all.